So, why did I decide all of a sudden to get rid of 1/4 of my collection? Exactly a month ago, I had an aunt who passed away. She was my dad’s younger sister, who left me and my cousins the task of figuring out where all her stuff would go. My aunt was 87 and had acquired a lot over the years. A week after she passed, my cousins and I headed over to the house where we all spent our Sundays together and were shocked at the amount of stuff that was there. Books (she was a voracious reader), furniture, clothes, tchotchkes, basically everything. The house had been sold and we had 30 days to get rid of everything. Today is actually D-day (it’ll be officially handed over to the new owner tomorrow) and save for a few things that need to be hauled out by truck, it’s pretty empty. The last couple of weeks had me thinking about my own things, and also the idea of Dostadning (Swedish Death Cleaning). I immediately cleaned out all my children's books, saved for the ones that still… sparked joy… and donated them to an orphanage. I’m in the process of getting all my architecture books to donate to my college library… Gotten rid of all my fluffy chick lit for donation to a group that sets up libraries in the provinces… and in the middle of all this, rediscovered all the paperbacks I read as a teen (even rereading some of them!). I’ve worked on a capsule collection for my wardrobe over the last two years so I don’t have much in the way of clothes to deal with, but books were a huge thing. Which then got me thinking about my decks. I know this is a long preamble, but I needed to get the story out of the way for all of this to make sense. After I was done organizing my books, I decided I needed to get cracking on my tarot decks. I know I have a lot of decks, but I also know my collection is nowhere near the half of the stuff I see on YouTube. After reading for people for three years now though, I’ve pretty much figured out which decks work for me and which ones don’t. There are pretty ones, sure, but some of them don’t actually get a lot of mileage, save for the deck reviews I post here and the photos I snap for my Instagram feed. Smudging the Emily Dickinson Tarot by special request! So I decided to let go of the ones that aren’t really in circulation, did a quick Deck Sale on Instagram, and am happy to report that almost all of them have found happy new homes. It feels wonderful to spread the love. Decks aren’t easily accessible in Manila (but Fully Booked is getting better at stocking titles!). That said, not a lot of people can get themselves a good indie deck. 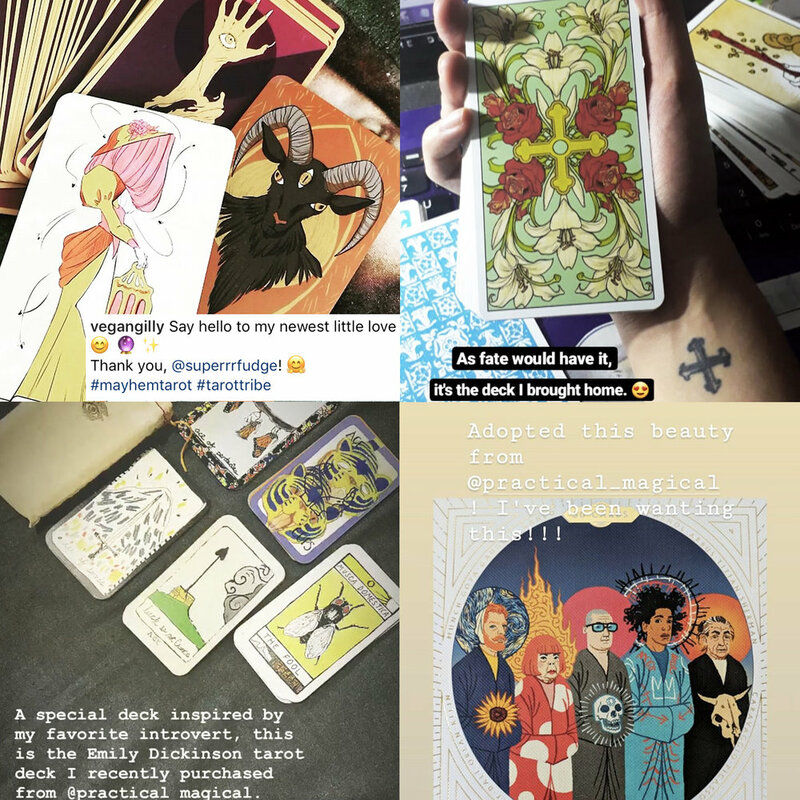 It felt great to have friends and strangers get excited about titles like the Mayhem Tarot, Cards of Chaos, and other awesome works that don’t get a lot of exposure. It’s great, not just for collectors and readers, but also for artists. It gives me an excuse to meet up with fellow deck geeks. 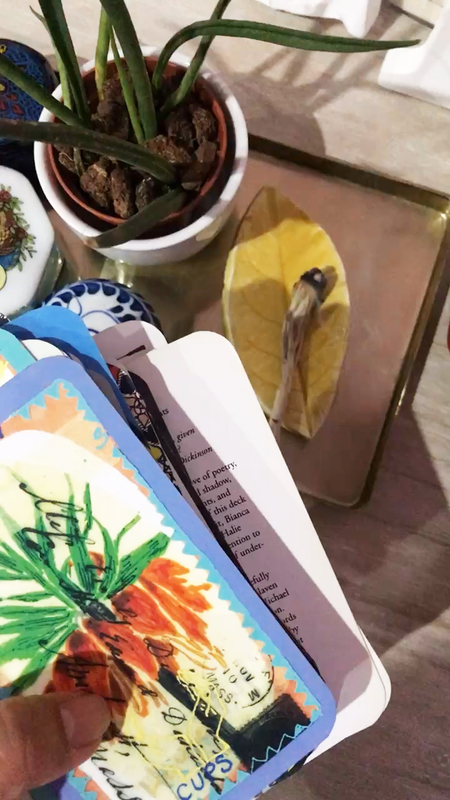 Practical Magic has allowed me to make connections with fellow readers online and, on the rare occasion, offline too. Because of this deck sale, I’ve had a chance to finally have a nice catch-up with folks I’ve met during pop-ups. It makes me feel warm and fuzzy knowing that they’ve become my friends IRL! I don’t need backups—repeat, I don’t need backups. I don’t know what the heck I was thinking, panic-buying extra copies of my favorite decks. I had it in my head that if I used a deck to read for others, I wouldn’t want to use it for myself anymore (I had extra cash—and a job—then, so I guess money was no matter?! LOL…). Not true! Now that I’ve been reading regularly for people, I feel like it doesn’t really matter which decks I use exclusively for myself or others. As long as clients don’t sully my stuff with ketchup-stained or pizza oil-stained fingers, then I’m fine. Nothing that a thorough wipe down and smudging can’t fix. It’s important to do deck research regularly. Here’s caveat #1 to my backup rule. I got my Jane Austen Tarot in a bookstore for less than Php1000, and years later I learned that the kit actually cost $900 and up on eBay. Backups are okay (recommended, even) when the deck appreciates. I know my ride or die decks now. Caveat #2 (LOL, didn’t I just say I didn’t need backups?) is I’ve figured out which decks just work. For me, for others, for me and others. And these are the decks whose backups I kept, not because I want energies mixed up or whatever woowoo thing I subscribed to before, but because I know I’ll be using these 10, 20, 30 years from now. I have three to five decks that tick the Ride or Die box and I can’t wait to tell you about them soon. Talk to you soon, guys. It’s back to the break for me.